Welcome to Vienna, the City of Music! Vienna is a city where composers such as Haydn, Mozart, Beethoven, Brahms, Strauss, Bruckner, Mahler, Schönberg and many others lived and worked. 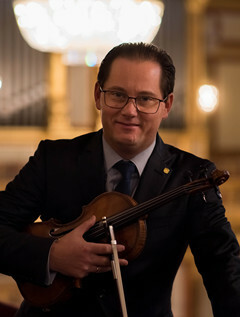 To know and love their compositions, and to perform them in Vienna's finest concert halls and other prominent Austrian cultural venues in front of interested and enthusiastic audiences is a wonderful task to which many musicians, including the members of the Vienna Philharmonic, have dedicated themselves. As a continuation of the thoughts of Gustav Mahler, who once said that, "tradition is the passing of the torch", it is our responsibility as performing musicians to maintain proven traditions while at the same time discovering and creating new perspectives. In this spirit, the annual "One Future - The World Orchestra Festival" in Vienna offers young people an outstanding platform for perfecting their musical abilities and exploring their own creativity. The Vienna Philharmonic and I personally are very pleased that every summer, numerous youth orchestras from around the world can meet in our City of Music and, during many workshops, they can share experiences, and reflect on questions of art and music, and continue to develop musical capabilities and perfect orchestral performance. As the high point and grand conclusion, a Gala Concert will take place on the world-famous stage of the Golden Hall of the Vienna Musikverein. We are convinced that, in addition to making music together, the participants will experience many valuable and inspiring encounters with other young musicians from all over the world. We wish all participants in the "One Future - The World Orchestra Festival" much success and we hope that your stay in Vienna will prove to be an unforgettable experience!